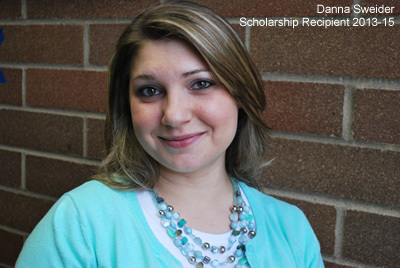 Danna Sweider received more than a scholarship. She received an education that accomplished her goal of being self-sufficient. My name is Danna Sweider and I am the grateful recipient of the Gladstone-Oak Grove Rotary Endowed scholarship, the Roger Rook Memorial scholarship, and the Reese Family Fund. I graduated from CCC with an associate’s in corrections and certificates in human services and alcohol and drug counseling. I grew up in Oregon City and went to Oregon City High School. I would’ve graduated in 2002, but sadly, that didn’t happen. As I entered my teen years, things started to fall apart for my mother. Then when I was 15, I found out my mom was heavily addicted to methamphetamine. At the age of 17, with only 5 months left of high school, I became homeless. I ended up missing a lot of school, falling behind on my homework and was subsequently kicked out of school one month before graduation. After I was kicked out of school, my life began to spiral out of control. I felt like I had nothing to lose, and I really wanted to know how my mom could choose meth over me and my sister, so I decided to try it. I was only going to do it once, but I didn’t realize how powerfully addictive that drug is, and before I knew it, I was using every day and couldn’t get out of bed in the morning without it. Then I lost my car and my license, and after 3 years of using every day, being kidnapped, sexually assaulted, and robbed at gunpoint, I was arrested and charged with felony possession of a controlled substance. I was sentenced to restitution, community service and probation. Although that charge may have tainted my permanent record, I saw it as a God send. It was an answer to my prayers... a way for me to finally get out of that lifestyle and turn over a new leaf. Then, 2 days after I met with my probation officer for the first time, I found out I was pregnant! At that moment, I knew without a doubt that this was my chance at a fresh start. My son gave me the motivation and determination I so desperately needed to overcome my addiction. Today, I have 10 years clean, and 10 years free from that lifestyle! As I set out on my new path, I didn’t know what I was going to do; all I knew was that I wanted to be self-sufficient and provide a great life for my son and myself on my own, without state assistance or any other outside help. I also wanted to find a career that I loved and that was meaningful, so that I would enjoy going to work each day. I wanted to do something that would make a difference in people’s lives. That dark time in my life wasn’t easy, but I don’t regret it one bit. Because if I hadn’t gone through all of that, I don’t know if I would’ve realized how interested I am in corrections, and how passionate I am about helping people. I also couldn’t have got to where I am today without CCC. My time here has helped set me on a path to greatness. I enrolled at CCC because I knew I would need an education to get into my career and accomplish my goal of being self-sufficient. But CCC has given me much more than just education and knowledge; it gave me strength and hope for a bright future, and showed me who I really am and what I’m capable of. And the scholarships I received gave me much more than just help paying for school, they gave me confidence, self-esteem, and helped me believe in myself again. Because of CCC and all the donors who make scholarships possible, I have the confidence and courage to fulfill my dreams of making a difference in society. Today, I cannot wait to graduate, with honors, and put my education into action in the field of corrections, helping other people turn over a new leaf and get their lives back, as well. On behalf of all of the scholarship recipients here today, I thank you all so much for making these scholarships available, so that we may pursue our dreams of a bright, self-sufficient future. And to my peers, I’d like to say, I hope the challenges you face in life only make you stronger. May you go confidently in the direction of your dreams, and never let life get you down; because you really can do anything you put your mind to.